On my first visit to Langrug in February 2011 I was surprised to hear that until a few months earlier the relationship between this sprawling hillside settlement and the municipality to which it belongs was very weak. There was also little knowledge of community dynamics on part of the community itself since in the previous few years Langrug’s population had been growing at breakneck speed, destabilising existing ties and creating new ones almost overnight. The opportunity to turn things around came in November 2010, when a court order forced the Stellenbosch-Pniel-Franschhoek municipality to upgrade the settlement’s waste disposal system to prevent toxic seepages to a nearby farm. Far from fighting the order or downplaying the measures needed to comply with it, the municipality grabbed the bull by the horns and incorporated its new waste management programme into a comprehensive slum regeneration strategy. This required a better knowledge of the space that planners, engineers and community leaders would soon to be dealing with, and self-enumeration was identified as the best tool to generate the required information. 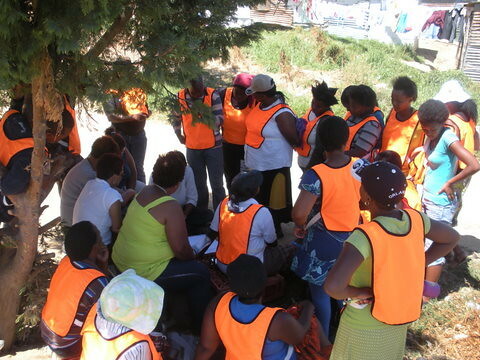 Therefore, in February 2011 CORC deployed a volunteer team of experienced community members from the ranks of ISN and the Western Cape Backyarders to mobilise Langrug. Enumeration followed suit, uncovering the existence of a diverse, vibrant, yet desperately in need of upgrading settlement of 2118 shacks and over 4700 people, one third of whom have currently access to neither electricity nor sanitary facilities. 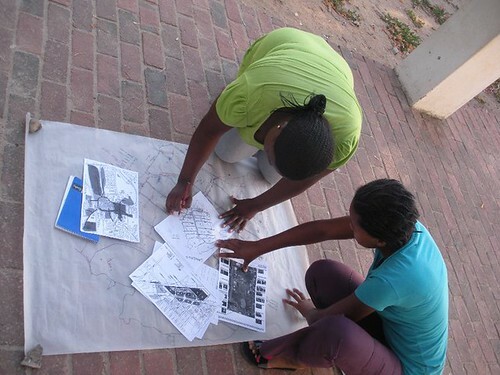 The enumeration was complemented by a thorough physical survey of the built-up land, which was undertaken by three dedicated community members – Kholeka Xuza, Olwethu Mvandaba, and Zukile Mapoko – over the same time period. CORC supplied an aerial photograph of the terrain as well as some guidance on conducting spatial analysis, and in particular on what indicators to look for and how to identify an area’s constraints or opportunities for development. Then, photograph and markers in hand, the team went out into the February heat to locate all the infrastructure and facilities that they had agreed could benefit from improved maintenance or upgrading. 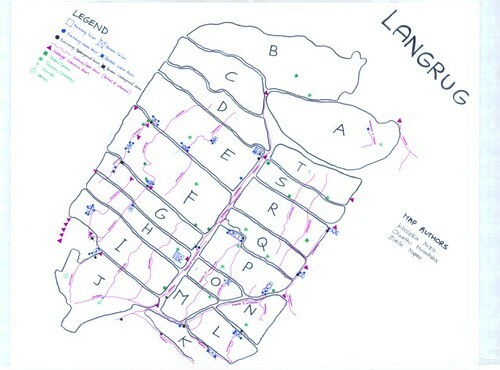 The result was an interim map that detailed the position and conditions of all Langrug’s toilets, water taps, drains, drainage gullies, electricity boxes, street lights, and commercial activities, and thus threw light on some of the settlement’s most pressing issues. For example, the map has uncovered that a large ablution block in the upper reaches of Nkanini, the largest of Langrug’s three sectors, is only partially functioning, with just six water taps out of ten in service and doors missing from three of its ten cubicles. 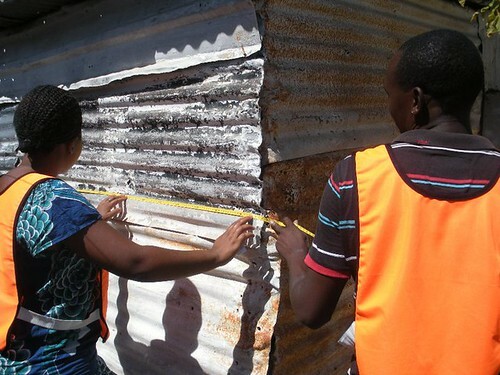 This clearly exemplifies the discrepancy between what the municipality thinks it is providing to the community and what the community is effectively provided with: “Sometimes we have to queue to draw water [and] toilets without a door are a big problem: They are dangerous and uncomfortable to use since we have to get a blanket to cover ourselves”, Olwethu explains. Likewise, notwithstanding the municipal engineers’ original intentions, Langrug’s drainage system has become a patchwork of broken concrete drains and community-dug gullies overflowing with garbage, the exact layout of which has also been detailed on the profilers’ map. In March 2011 this was then presented by its authors to the Stellenbosch Municipality’s Board of Directors, who responded to the community’s main infrastructure-related grievances by calling for a list of tangible requests, articulated as a masterplan, to be submitted to the municipality for consideration. But what is perhaps more interesting is that in line with CORC’s mission of promoting community empowerment by helping people to capacitate themselves, Langrug’s profiling team is now teaching other communities to look at their own settlements with a critical eye. Kholeka has just returned from a successful training mission in nearby Kylemore and is now looking forward to taking on even bigger challenges, such as relaying her experience to profilers in Stellenbosch’s other mammoth slum, Kayamandi: “They are also very large, and they are located on a hill like us, so their problems will be similar to ours. I think they will find the type of profiling that we are doing here very useful, and we can also learn from the way they are dealing with some of the challenges [posed by] maintaining facilities or dealing with flooding”. “Yes,” Olwethu chimes in “and we are also looking forward to trying GIS mapping as it will make it easier to communicate to the municipality what the problems in our settlement are, and what can be done to fix them”. So, is the profiling team being trained in computer-aided mapping, I ask? “We have already been to a presentation [on the merits of GIS] and CORC is now supervising our training in computer literacy. We are also attending meetings on various topics such as strategic planning and savings; it is important that [we have a good grasp of] different perspectives if we want to involve other communities in the planning of their own space”. Sometimes, however, even the best planning strategies remain at a theoretical stage, with implementation being squashed under the burdensome weight of unfriendly policies, lack of interdepartmental co-ordination, and rampant budgeting inefficiency. But in this case, I am informed, the municipality is going to take up the challenge of making good use of the community’s hard work and improve Langrug’s living environment. Thus, while the profiling team is busy preparing a masterplan for the next budget allocation meeting, agreements are being made to have leaking taps fixed and blocked drains unblocked. Moreover, the survey has uncovered a number of illegal water connections that weaken water pressure and that, since illegal taps tend to have no corresponding drain, contribute to worsening Langrug’s greywater problem. Once alerted of the issue by the profilers, the community agreed to ask the municipality to sever all illegal water connections as a stopgap measure while a more powerful water pump is being installed and a better drainage system built: “We cannot wait for the government to come to us with their plans,” Kholeka says, “but we need to take the matter in our hands as we know what our settlement is like and what we need to improve it”.